After conducting the Endodontic workshop in Kanpur on 7th of April 2018, we drove to Lucknow and stayed with relatives for two days. I got the best 'meetha pan' that I ever had in my life there. On 10th morning we started for Darbanga. It was 'Bharat bandh' that day and we had to face many delays on the way. At one time when we were behind several kilometers of static trucks, two local cars took a detour and we followed them. After sometime we saw another long line of vehicles. It was due to some accident that had happened and there was no way to go beyond. As if Godsend, two police vehicles appeared from nowhere. When they saw they also couldn't go ahead, they turned around and took a different route along very narrow roads through villages. Immediately we followed them. When vehicles came from the opposite direction, a police officer would get down, stop them and make way for their vehicles to pass. Then we also got to move ahead. 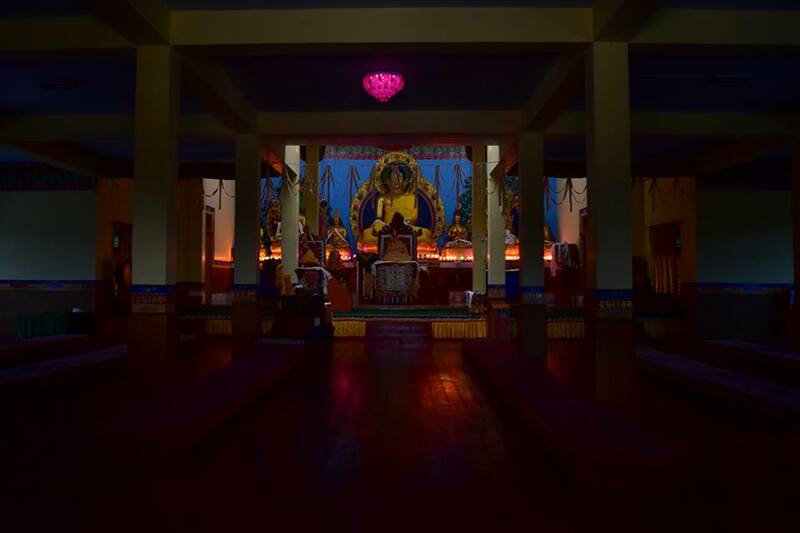 We visited the Buddha temple in Kushinagar on the way. Kushinagar ia a principal center of Buddhism, where Lord Buddha passed away near the Hiranayavati river and was cremated at the Ramabhar stupa. Before we started our journey I had come across a very powerful mantra, which I by hearted. Throughout the journey I was chanting it and experienced many miracles that made our trip smooth. 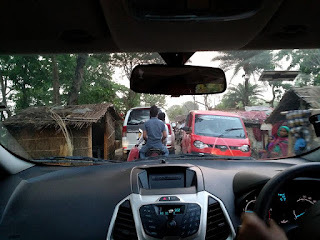 Apart from the above two incidents, whenever we were in doubt of the road, the roads looked too deserted to be comfortable, or the condition of the road was too bad with stagnant water, two local cars would appear in front. Then it was easy to just follow them. We were looking around for a hotel to stay at night, around eight o'clock we reached Darbanga and spotted a hotel. Luckily we got a reasonable room and called it a day. Next day morning (11th) after breakfast we were on the road again. The traffic was more and for quite a stretch the road was hardly visible due to fog. One white broken line on the center of the road just in front of the car was all that could be seen. We had informed our friend in Bongaigaon that we would reach and he gave us his address. He told that the drive would take about eight hours, for us to reach around five pm. Due to the traffic conditions it didn't seem possible and we thought of halting somewhere as it was getting dark. Ultimately we had to drive up to Bongaigaon as no hotels were in sight. Since we didn't want to get inside the city to find our friend and as we found a good hotel to stay, we ended that day's journey at eight o'clock. On 12th morning we started towards Bomdila. Now the temperature was going down and I don't like the cold weather at all. 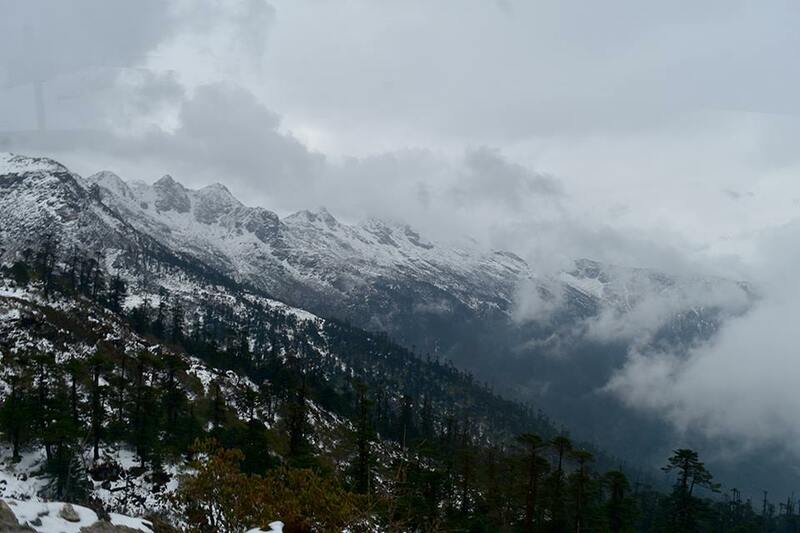 It was drizzling in between and by the time we reached Bomdila it was dark. After a little search we got a room in Hotel La. Since the three days drive had gotten into my nerves, I asked my husband what the next day's plan was. 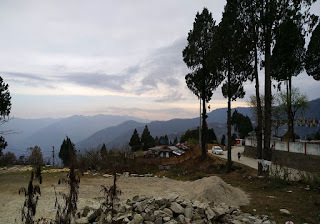 When he told that Tawang was the next destination (again full day drive), it blew my fuse off. More than the distance, something about the future experiences came on my mental screen and I threw a big tantrum, though later I realised that a discussion would have been sufficient. Due to my reaction he made two changes in the plan. On the next day we were to drive just for an hour and halt at Dirang and stay at Sangti valley, which is considered a magical place. Second, he would hire a vehicle for the Bum La pass visit, instead of taking our car. 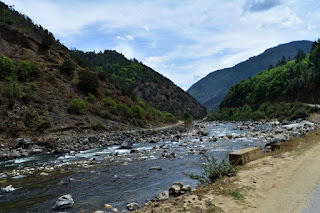 We reached Sangti valley and started looking around for the 'magical experience'. It was a bit of disappointment and so we drove to the popular Pema Ling hotel. 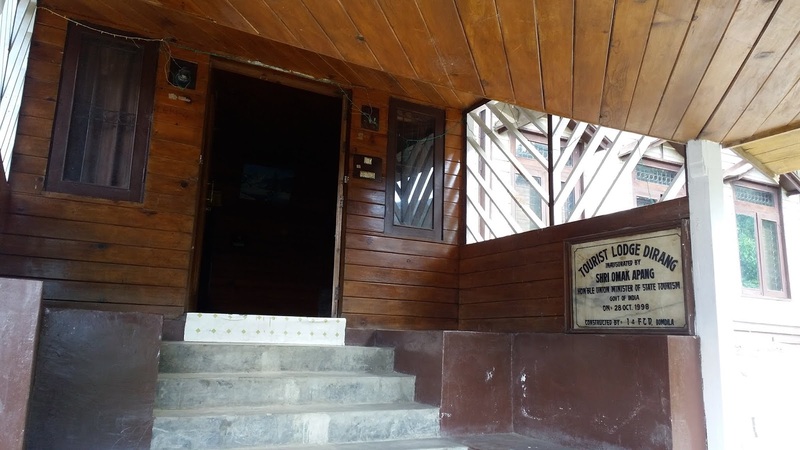 They didn't have any rooms and when we were about to drive ahead, a man rushed towards us and said, 'If you are looking for a room, we have in our Tourist Lodge'. And it shared the wall with Pema Ling hotel. After the lunch we took a walk around and saw some beautiful birds. At dusk time I meditated looking at the mountains and saw the silhouette of Rishi Vashishta, got his message and witnessed the expanding, dancing aura of the mountains.